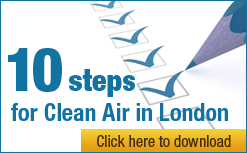 “Clean Air in London (CAL) urges Commissioner Potočnik to launch infraction urgently against the UK prioritising the 16 zones for which no time extension was sought for NO2 (including London) and the seven zones which have breached the terms of time extensions granted or offered for NO2. “The Government is trying to cover-up breaches of the PM10 daily limit value in London in 2012 by dismissing some monitors and blaming ‘sea salt’ when it admits the worst particle smog episodes occurred when wind speeds were low and/or from the north of mainland Europe. The Government has confirmed again it has not consulted other Member States on significant air pollution originating in other Member States. “CAL therefore calls on Commissioner Potočnik to launch infraction against the UK for breaching the PM10 daily limit value in London in 2012 including in Marylebone Road in Westminster, Neasden Lane in Brent (78 Bad Air Days), Horn Lane in Ealing (48 Bad Air Days), Shepherd’s Bush in Hammersmith (69 Bad Air Days) and Upper Thames Street in the City of London (53 Bad Air Days). 2. The highest levels of NO2 in the UK outside London were reported for Glasgow at an annual mean of 72 ug/m3 i.e. nearly twice the legal limit and World Health Organisation guideline (WHO) Tab 11f. 5. Government claims Marylebone Road had the highest exceedances of NO2 at an annual mean of 94 ug/m3 Tab 11 when far higher levels were recorded at other locations e.g. Putney High Street (155 ug/m3). 6. The Government’s own report shows annual average concentrations of NO2 have not declined during the last 10 years at eight long-running traffic urban sites that include Bath Roadside, Camden Roadside, Glasgow Kerbside, Exeter Roadside, Haringey Roadside, London Marylebone Road, Oxford Centre Roadside, and Tower Hamlets Roadside) (Figure 5-6 on page 43 of the full report). 7. The Government claims sea salt has reduced the number of exceedances of the PM10 daily limit value from 46 to 35 i.e. the maximum permitted level Tab 23a. 9. The annual mean concentration of PM2.5 in Marylebone Road in London was 22 ug/m3 and 21 ug/m3 after the deduction of sea salt Tab 18. This exceeded the PM2.5 ‘Exposure Concentration Obligation’ (known as the Stage 2 Limit Value) of 20 ug/m3 which must be met by 1 January 2020. It is twice the WHO guideline for PM2.5. 10. The Government has confirmed the UK has not consulted other Member States on significant air pollution originating in other Member States Tab 25a. 11. 246,179 people at background locations alone, including 229,147 in London, were exposed to levels of NO2 exceeding the legal limit and the WHO guideline in 2012. The UK has refused for many years to comply with Article 5 of the 4th daughter directive requiring it to estimate the total number of people exposed to such levels of air pollution i.e. including urban roadsides Tab 19b. 12. International health standards have been exceeded for exposure to benzo(a)pyrene (76,777 people affected in the Belfast, North East, Northern Ireland, North Wales, South Wales, Swansea, Teeside, Yorkshire and Humberside zones) Tab 19k, nickel (3,286 people affected in the Swansea and South Wales zones) Tab 19j and ozone (millions of people affected) Tab 19g. In Gibraltar, 29,752 people were exposed to levels of nickel exceeding international health standards Tab 14c due to local industry including power production.